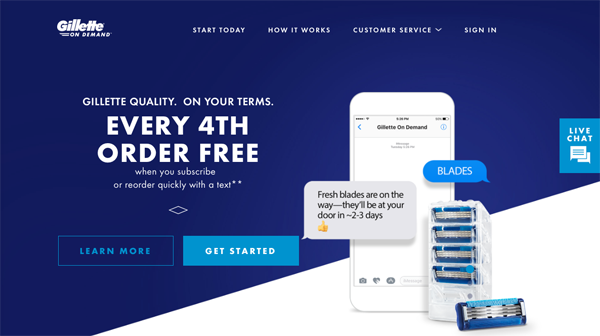 Just when you thought buying razor blades couldn't get any easier, along comes Gillette on Demand, a new service that lets men order refills via text message. Launched on May 9, Gillette on Demand is an upgraded version of the Gillette Shave Club, a 2-year-old subscription service that the Procter & Gamble brand launched in response to the growing market share gains of online category disruptors Dollar Shave Club and Harry's, Inc. Dollar Shave Club was acquired by P&G rival Unilever in 2016; Harry's now sells through Target. The new service retains the existing subscription model but now also offers an on-demand option that boasts what P&G is calling an "industry-first re-order process." Subscribers can text the word "Blades" to a special number (also "BLADES") to order refills. Dollar Shave Club currently only offers subscription services. Harry's, on the other hand, also allows single-order purchases. Gillette on Demand is luring subscribers by promising every fourth order free. First-time customers get $3 off the first order. "The creation of this new service and its features is fueled by the understanding that accessibility, shopping experience, and value are every bit as important to men as quality and product innovation," according to P&G's official release about the program. But it also is most certainly fueled by P&G's need to recapture some of the market share it has lost to Dollar Shave Club and Harry's in the last few years — especially since the former company now has the global power of Unilever behind it. Compounding the issue are trends in men's grooming that have made facial hair far more popular. P&G is calling Gillette on Demand "the company’s first direct-to-consumer service, delivering … blades straight from Gillette facilities to men’s doorsteps in about 2-3 business days." But it has been testing other DTC models, including several recent efforts with Tide laundry detergent. Rampant shoplifting of razor blades has forced many retailers (with assistance from P&G and other manufacturers, of course) to lock up on-shelf inventory or keep the products out of shopper reach. That has significantly increased the costs of maintaining the category, and quite possibly has improved the perception of online fulfillment as a simpler option for both consumers and suppliers.